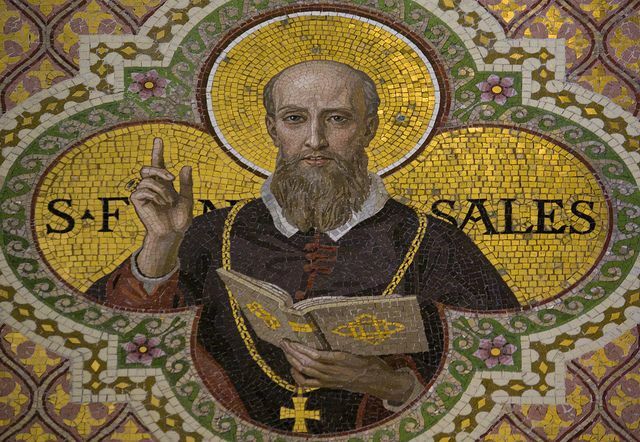 Jan 24 – St Francis de Sales, CO, OM, OFM Cap, (1567-1622), Doctor of the Church, “Gentleman Saint” | ADULT CATECHESIS & CHRISTIAN RELIGIOUS LITERACY IN THE ROMAN CATHOLIC TRADITION: hosting ONLY True Christians!! !, or "How to think Catholic!!" You may have heard the expression: “A spoonful of honey attracts more flies than a barrelful of vinegar.” You can thank St Francis de Sales for that one. He also lived it. 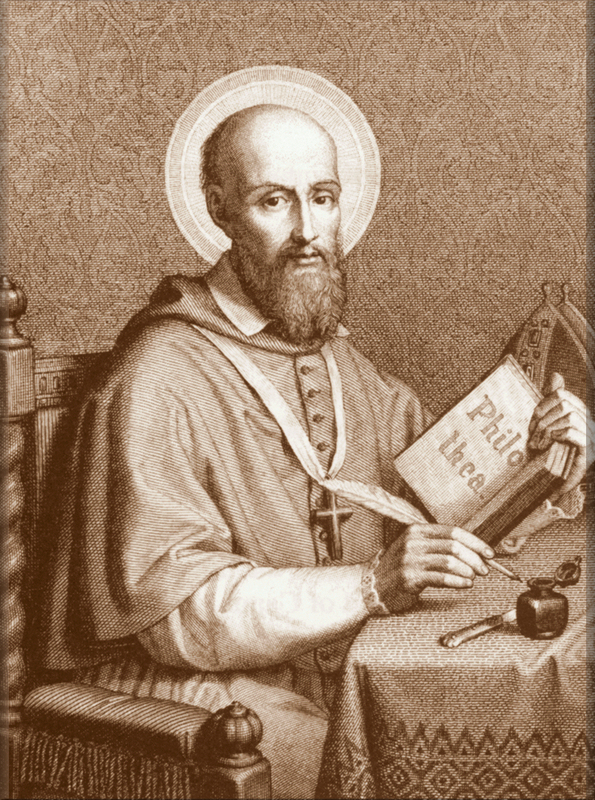 Francis de Sales (French: Saint François de Sales) (August 21, 1567 – December 28, 1622) was Bishop of Geneva. He is known also for his writings on the topic of spiritual direction and spiritual formation, particularly the Introduction to the Devout Life, along with his Treatise on the Love of God. His writings on the perfections of the Heart of Mary as the model of love for God influenced St Jean Eudes to develop the devotion to the Hearts of Jesus and Mary. Born in the castle of Château de Thorens to a well-placed Savoyard family, the eldest of twelve children born to François de Boisy and Françoise de Sionnz. His parents intended that Francis become a soldier, then a lawyer, enter politics, and carry on the family line and power. He studied at La Roche and Annecy in France, taught by Jesuits. Attended the Collège de Clermont in Paris, France at age 12. Francis knew for thirteen years that he had a vocation to the priesthood before he mentioned it to his family. When his father said that he wanted Francis to be a soldier and sent him to Paris to study, Francis said nothing. Then when he went to Padua to get a doctorate in law, he still kept quiet, but he studied theology and practiced mental prayer while getting into swordfights and going to parties. In his early teens, Francis began to believe in pre-destination, a heresy, and was so afraid that he was preemptorily condemned to Hell that he became ill and eventually was confined to bed. However, in January 1587 at the Church of Saint Stephen, he overcame the crisis. Francis came to the conclusion that whatever God had in store for him was good, because “God is love”, as Scripture attests. This faithful devotion to the God of love not only expelled his doubts, but also influenced the rest of his life and his teachings. His way of teaching Catholic spirituality is often referred to as the Way of Divine Love, or the Devout Life, taken from a book he wrote of a similar name: Introduction to the Devout Life. Studied law and theology at the University of Padua, Italy, and earned a doctorate in both fields. He returned home, and found a position as Senate advocate. Even when his bishop told him if he wanted to be a priest that he thought that he would have a miter waiting for him someday, Francis uttered not a word. Why did Francis wait so long? Throughout his life he waited for God’s will to be clear. He never wanted to push his wishes on God. God finally made God’s will clear to Francis while he was riding. Francis fell from his horse three times. Every time he fell the sword came out of the scabbard. Every time it came out the sword and scabbard came to rest on the ground in the shape of the cross. And then, Francis, without knowing about it, was appointed provost of his diocese, second in rank to the bishop. It was at this point that he received a message telling him to “Leave all and follow Me.” He took this as a call to the priesthood, a move his family fiercely opposed, especially when he refused a marriage that had been arranged for him. However, he pursued a devoted prayer life, and his gentle ways won over the family. Perhaps he was wise to wait, for he wasn’t a natural pastor. His biggest concern on being ordained that he had to have his lovely curly gold hair cut off. And his preaching left the listeners thinking he was making fun of him. Others reported to the bishop that this noble-turned- priest was conceited and controlling. Then Francis had a bad idea — at least that’s what everyone else thought. This was during the time of the Protestant reformation and just over the mountains from where Francis lived was Switzerland — Calvinist territory. 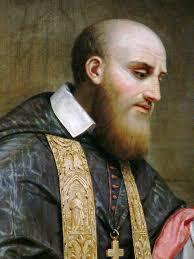 Francis decided that he should lead an expedition to convert the 60,000 Calvinists back to Catholicism. But by the time he left his expedition consisted of himself and his cousin. His father refused to give him any aid for this crazy plan and the diocese was too poor to support him. Francis’ unusual patience kept him working. No one would listen to him, no one would even open their door. So Francis found a way to get under the door. He wrote out his sermons, copied them by hand, and slipped them under the doors. This is the first record we have of religious tracts being used to communicate with people. The parents wouldn’t come to him out of fear. So Francis went to the children. When the parents saw how kind he was as he played with the children, they began to talk to him. By the time, Francis left to go home he is said to have converted 40,000-72,000, by some accounts, people back to Catholicism. In 1593 he was appointed provost of the diocese of Geneva, Switzerland. Preacher, writer and spiritual director in the district of Chablais. His simple, clear explanations of Catholic doctrine, and his gentle way with everyone, brought many back to the Roman Church. He even used sign language in order to bring the message to the deaf, leading to his patronage of deaf people. In 1602 he was made bishop of the diocese of Geneva, in Calvinist territory. He only set foot in the city of Geneva twice — once when the Pope sent him to try to convert Calvin’s successor, Beza, and another when he traveled through it. At that time, the way of holiness was only for monks and nuns — not for ordinary people. Francis changed all that by giving spiritual direction to lay people living ordinary lives in the world. But he had proven with his own life that people could grow in holiness while involved in a very active occupation. Why couldn’t others do the same? His most famous book, Introduction to the Devout Life, was written for these ordinary people in 1608. Written originally as letters, it became an instant success all over Europe — though some preachers tore it up because he tolerated dancing and jokes! To love — or to die! To die — and to love! “O Lord God, was it not enough to permit us to love You without its being necessary to invite us to do so by exhortations, even obliging us to do so by commanding it? Yes, O divine Goodness, in order that neither Your greatness nor our lowliness, nor any other pretext could prevent us from loving You, You have commanded us to do so. O my God, if we could only comprehend the happiness and honor of being able to love You, how indebted we should feel to You, who not only permit but command us to love You! O my God, I do not know whether I should love more Your infinite beauty which Your divine goodness commands me to love or this goodness of Yours which commands me to love such infinite beauty! O beauty of my God, how lovable you are, being revealed to me by Your immense goodness! O goodness, how lovable you are, communicating to me such eminent beauty! O Lord, in heaven we shall need no commandment to love You, for our hearts, attracted and ravished by the vision of Your sovereign beauty and goodness, will necessarily love You eternally. There our hearts will be wholly free of passions, our souls will be completely delivered from distractions, our minds will have no anxieties, our powers will have no repugnances, and therefore we shall love You with a perpetual, uninterrupted love. But in this mortal life, we cannot achieve such a perfect degree of love, because, as yet, we do not have the heart, the soul, the mind, or the powers of the blessed. Nevertheless, You desire us to do in this life everything that depends on ourselves to love You with all our heart and all the strength we have; this is not only possible but very easy, for to love You, O God, is a sovereignly lovable thing” (cf. 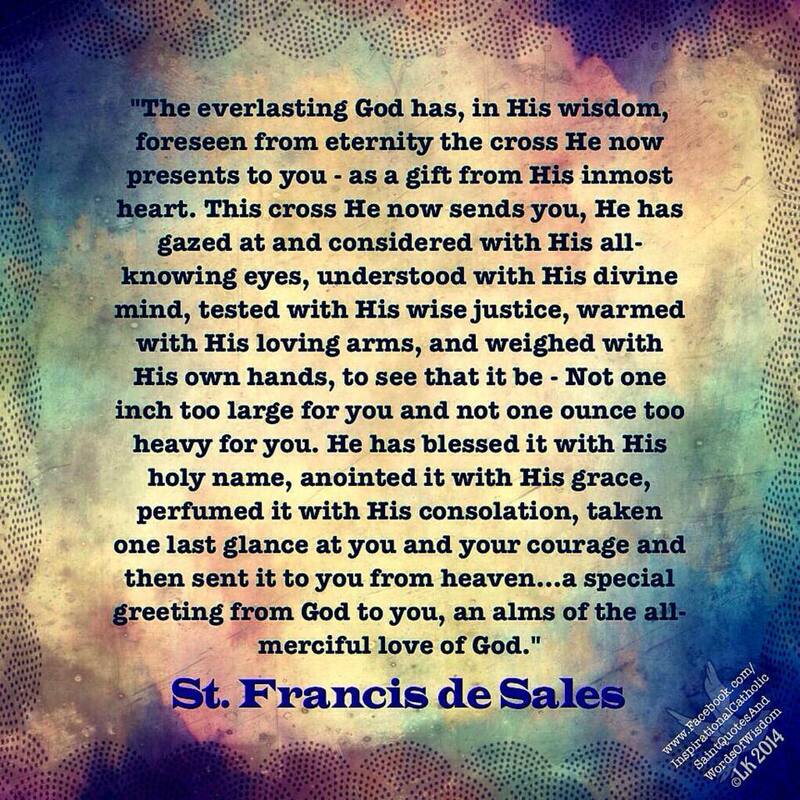 St. Francis de Sales).